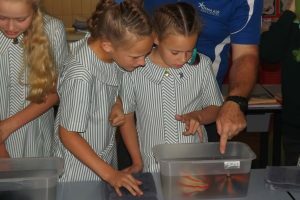 Ocean Life Education delivers fun marine education incursions, where students are given the opportunity to interact with a variety of live marine creatures. Our programs are all closely aligned with the Australian National Curriculum, delivering lessons across a broad range of topics including animal habitats, adaptations and classification. Through carefully controlled contact, children learn why animals’ look and feel the way they do, how their bodies function, what their individual roles are in their environment and therefore why we need to look after them. We understand all children are different and absorb information in different ways. As passionate educators ourselves, the staff at Ocean Life Education value the importance of connecting students with their subject and showing them that science is a living, breathing part of their world. Children respond extremely well to having real animals at their fingertips – this one-on-one experience provides a greater depth of understanding which leads to the desire to protect them. What better way to understand Life Cycles, than to see one of our baby sharks at close quarters and observe the eggs they hatched from and note the often significant differences from their adult version? We will tailor our programs to your classrooms’ current unit theme for all levels of school learning. Ocean Life Education is proud to be involved in educating tomorrow’s leaders in environmental awareness and protection. Our hope is to imprint in every Australian a sense of ownership and protectiveness of our marine environment, and together we will lead the world in the changes necessary for a healthy planet. FREE colourful bookmark to take home! For more information, visit our School Programs page or Contact Us to request a program outline for your year level. This entry was posted in Schools and tagged Australian Curriculum, education for sustainability, School Incursions, science incursion, sea creatures on February 3, 2019 by oceanlifeeducation.